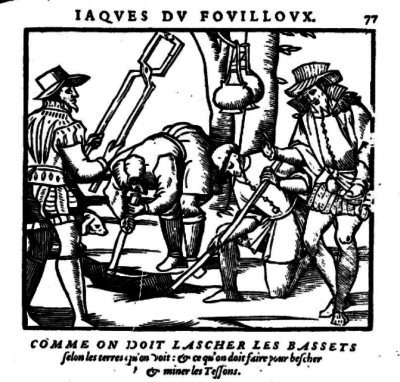 Jaques du Fouilloux published his treatise on hunting in 1561 and, in the years to follow there were several reprints. 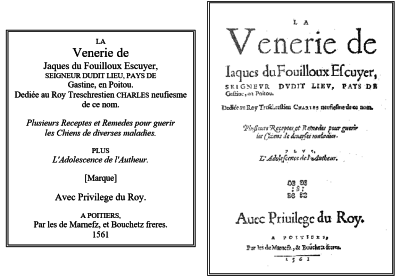 It was in this book La Vénerie he said that Bassets he used to wage war against the badgers were from Artois. However, it wasn’t until the second half of the nineteenth century when the various hound breeds became more defined, that the Basset d'Artois truly emerged. Leading up to this, two very distinct types dominated - those bred by Le Couteulx de Canteleu near Etrepagny, and the others originating in the kennel of Louis Lane, who lived near Rouen. Le Couteulx produced a more Artesian (artésien) type whereas Lane, probably from personal taste, had veered off slightly in favour of what would later be called the Norman (normand) type. Bearing in mind that, around this time, hunting qualities prevailed over conformation Le Couteulx looked for a type with nearly straight forelegs, which would neither slow the dog down nor drain its energy when working in difficult terrain, brush and briar. He also preferred a slightly more compact body and a head reminiscent of the former great Chien d’Artois. Louis Lane, however, placed greater importance on a pleasing eye. His dogs had magnificent heads with long, well turned ears, akin to the nobility of the old Norman breed but their exaggerated crooked front legs (à jambes torses) slowed them down and they lacked enthusiasm when hunting, having a more reserved nature. 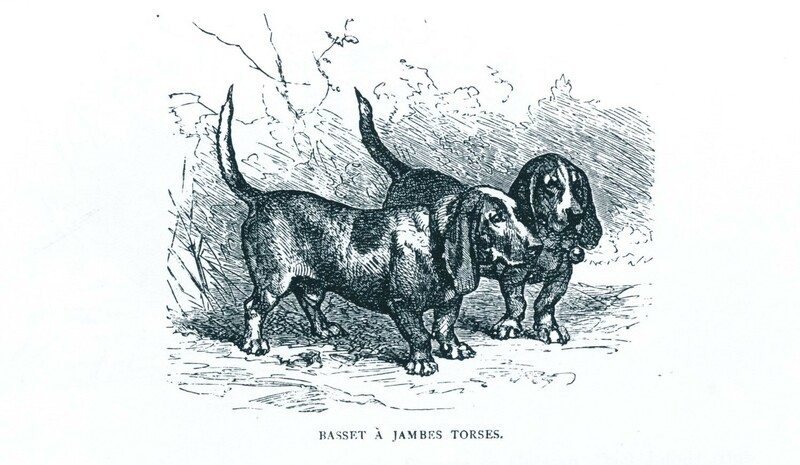 These two types dominated, existing side by side for around twenty years but, as time passed, in their quest to produce a dog with the best qualities of each line, most huntsmen ending up preferring to mix the two strains to varying degrees. 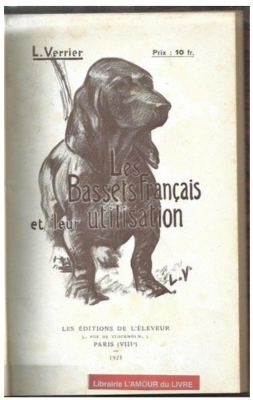 Thus, on 26 May 1889, during a meeting of the Club du Basset Français the name “Basset Français à poil ras des varietés Lane et Le Couteulx” was changed to Basset d’Artois. 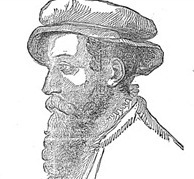 Le Couteulx was President of the Club. When the first Breed Standard for the Basset d’Artois was written in 1898, most of the dogs were still a mixture of artésien characteristics (Le Coulteulx) and normand (Lane). 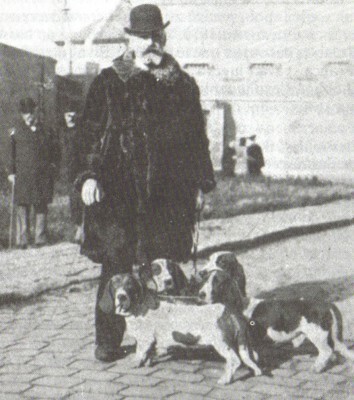 However those considered to be the best examples of the breed were bred by Léon Verrier, who went to be thought of as the father of modern Basset Artésien Normand. 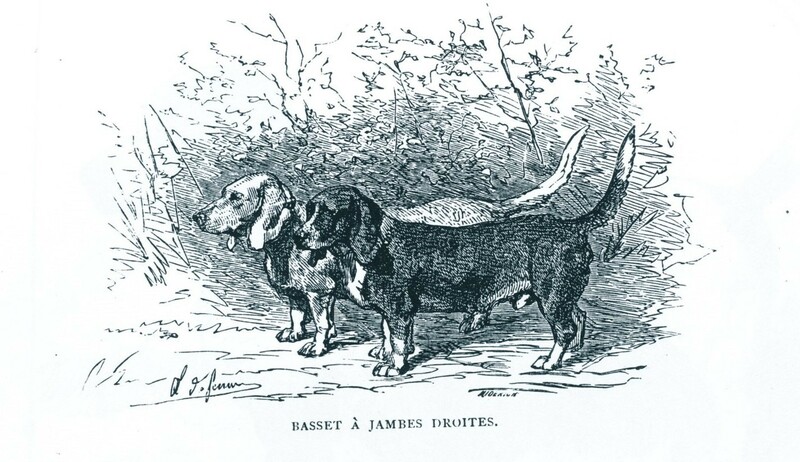 He had started his pack of Basset d’Artois in 1874 from mostly Le Couteulx strain but he finally succeeded in obtaining the last representatives of the Lane line and the combination of the two perfected a Basset combining the best qualities of the two types. After a somewhat unsuccessful appearance at the Paris Dog Show in 1891, he returned in force in 1898 and from then on his preferred type, markedly normand, dominated at shows for around fifteen years. Verrier's influence though was more as a judge and head of the breed club, which was founded in 1910. The Standard was modified and the breed finally recognised in 1911. 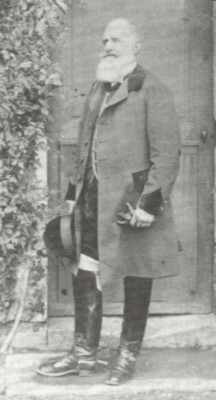 Tragically Verrier's pack was wiped out by sickness during the first world war but, in 1922, the club decided to promote the breeding of only his type. 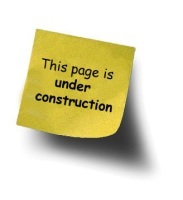 This was the year after he had published a book entitled "Les Bassets Français et leur Utilisation". It wasn’t until 1924 that the breed became known as Basset Artésien Normand, the club adopted this name and further alterations to the Standard took place. Then in 1927, aged 77, Leon Verrier took over the presidency. 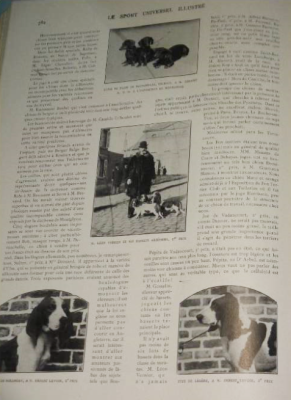 He subsequently sought to strengthen the “normand” characteristics of the breed and, in the 1930 book of Standards for hunting breeds where the two breeds Basset d’Artois and Basset Artésien Normand are included, an observation is made: “The committee of the Société de Vénerie has decided and notes that the Basset Artésien Normand should not be a transitional step towards a Normand type, without any trace of Artois”.